One of the simplest things you can do is keep grass clippings out of the street and sidewalk. 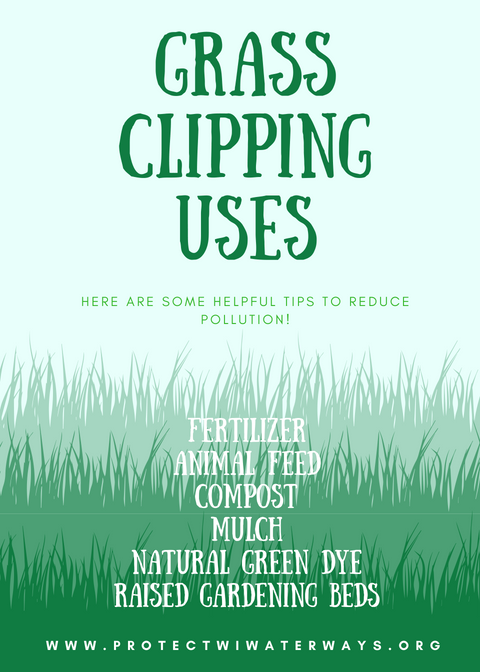 This may sound like a little thing because grass clippings are small and natural, but when everyone cuts their grass all summer long, that adds up to a lot of clippings! When grass clippings land in the street, they can be washed directly into local streams and lakes through storm drains. Clippings carry fertilizers to waterways and the grass itself also breaks down into nutrients. These nutrients and fertilizers are the perfect food to grow algae. When grass clippings are washed into the water, they feed algae and can turn a beautiful pond into a blue and green mess. Mow it High & Let it Lie: One popular lawn care misconception is that leaving clippings on the lawn after mowing causes thatch buildup. However, the truth is that thatch is caused at the root level, not from grass clippings. Instead of raking clippings into the street, leave them on your lawn where they are less likely to wash away. The pieces break down quickly and provide nitrogen when they decompose, doing the same job as the expensive fertilizers bought in stores. Letting grass clippings stay on the lawn will allow you to skip one fertilizer application and reduces the number of waste bags needed to collect and store the clippings. Mow High: Set your mower at the highest possible setting, usually between 2.5” and 3”. This does two things: first, taller grass plants have healthier roots, which leads to a better, thicker turf that can withstand drought and second, the taller, thicker grass shades out weeds. Mow Sharp: Sharpen your mower’s blades 2-3 times each year. Dull blades tear the grass instead of cutting it. The torn blades dry out, giving the grass jagged brown or white tips.